Zapping ray guns, powerful tractor beams, glowing gems–why do these 21st-century marvels exist only in fiction? For Stephen Wilk ’84 (MS), an editor and contributor at Optics and Photonics News, such questions are part of a lifelong fascination with the intertwining of science and imagination. “I’ve been collecting weird bits of optics like this for a long time,” he says. 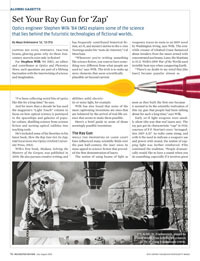 And for more than a decade he has used the magazine’s “Light Touch” column to focus on how optical science is portrayed in the spaceships and galaxies of popular culture, distilling science from science fiction and turning optical oddities into teaching tools. He’s included some of his favorites in his latest book, How the Ray Gun Got Its Zap: Odd Excursions into Optics (Oxford University Press, 2013). Wilk’s first book, Medusa: Solving the Mystery of the Gorgon, was published in 2000. He also pursues creative writing, and has frequently contributed historical fiction, sci-fi, and mystery stories to the e-zine Teemings under his “nom-de-Internet,” Cal Meacham. “Whenever you’re writing something like science fiction, you want to have something very different from what people are used to,” says Wilk. The trick is to make up story elements that seem scientifically plausible yet beyond current abilities–solid electricity or noisy light, for example. Wilk has also found that some of the most captivating inventions are ones that are bolstered by the arrival of real-life science that seems to make them possible. While the properties of laser light have influenced many scientific fields over the past half-century, the laser owes its mass appeal to science fiction that preceded the first demonstration of lasers. The notion of using beams of light as weaponry traces its roots to an 1809 novel by Washington Irving, says Wilk. The erstwhile creator of Ichabod Crane fantasized about invaders from the moon armed with concentrated sun beams. Later, the Martians in H. G. Wells’s 1898 War of the Worlds used invisible heat rays when conquering Earth. 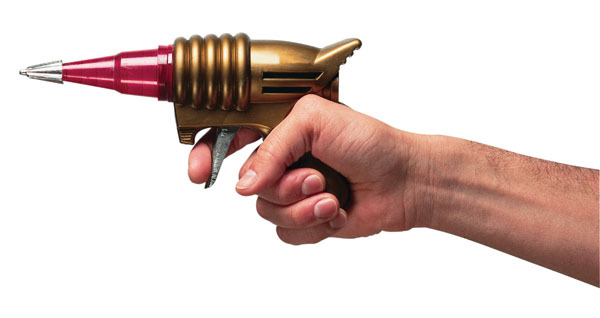 “There’s no doubt in my mind that [the laser] became popular almost as soon as they built the first one because it seemed to be the scientific realization of this ray gun that people had been talking about for such a long time,” says Wilk. But in the preface to his wife’s book, Percy Bysshe Shelley refers to the use of electricity to animate dead flesh. At the time, the experiments of 18th-century Italian scientist Luigi Galvani were well-known. Galvani discovered that when he applied electric current to the legs of dead frogs, the muscles would begin to twitch. That eventually gave rise to wide experimentation with electrical (re)animation in Europe. Some scientists even tried it with human bodies. In the 19th-century there was a popular belief that an image of a killer was imprinted onto a murder victim’s eyes. And so, in the 1870s, German scientist Wilhelm Friedrich Kühne put popular culture to the test and claimed to discover “optography.” He carefully prepared the eyes of albino rabbits by first keeping them in the dark and then exposing them to a bright, barred window. Swift execution, extraction of the eyes, and separation of the retina followed. Kühne “developed” the retina in alum solution and, behold, the “biological photograph” showed a clear image of the bars. Suppose you find yourself stranded in the wilderness. As luck would have it, you’re near-sighted. Don’t bother trying to start a fire with your spectacles, despite what you remember from Lord of the Flies. The scene when the boys start a fire using Piggy’s glasses is woefully misleading. Lenses that correct for myopia are negative, and therefore couldn’t concentrate light to start a fire the way a magnifying glass would. “I wear such glasses myself and it amazes me when I have the sun behind me. I can see the limits of the light that has passed through the lenses, and it’s larger. So obviously it wouldn’t focus the light down,” says Wilk. Maya Dukmasova ’12, ’13 (T5) is a freelance writer based in Chicago.